Serving Pensacola FL, Santa Rosa County, Escambia County, and surrounding areas. Artice L. McGraw, Pensacola Personal Injury Attorney, provides his legal services to clients throughout the area. Let him help you with your personal injury lawsuit or wrongful death lawsuit. Get to the bottom of your legal concerns with assistance from Mr. McGraw. Contact him today, to learn more about how you can protect your rights and interests. 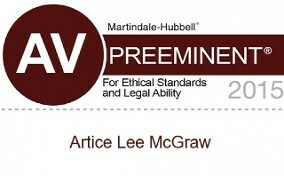 Artice L. McGraw in Pensacola, Florida, offers comprehensive legal services. A lifelong resident of the area, Mr. McGraw has been practicing law for more than 44 years. He is a sought-after trial lawyer, successfully helping clients file and settle personal injury and wrongful death lawsuits. Fees are contingency based and are dependent on results. Have you or someone you love been the victim of an accident? When tragedy strikes, McGraw Law is there. When you’re injured, in pain, unable to work, worried about medical bills, and fielding paperwork from doctors, insurance companies, and law enforcement officers, we’re on your side to help you make sense of it all and help you get the compensation you need to pay your bills and support your family while you focus on your recovery. But what if the worst has happened, and you or someone you love has succumbed to medical malpractice or been killed in an accident? You need a wrongful death lawyer in Escambia County who knows how to negotiation with insurance companies and defendants to get you the money you deserve. This is no time to try and take on an insurance company and its experienced legal team by yourself. Your insurance company and its lawyers don’t care about helping you recover from the awful setback that is wrongful death or personal injury — but our Pensacola personal injury attorney does. We can tell you right away whether you’ve got a case and whether you’re likely to win, so you can avoid expensive and time-consuming litigation that doesn’t result in a victory and a settlement. But that’s not all we can do to help. We can help you navigate the confusing red tape necessary to process a personal injury or wrongful death claim. We have the negotiating experience necessary to deal with the insurance company’s lawyers to get you the maximum amount of compensation. Whether you end up with a settlement or a jury verdict, you’ll get the best results with help from a personal injury attorney. Best of all, you won’t have to pay any fees unless our wrongful death and personal injury attorneys succeed in getting you the compensation you deserve. That means you have no reason not to call McGraw Law for a free consultation. We’ll talk to you about the details of your case and let you know whether you can expect to receive compensation. Call McGraw Law now to get the compensation you need and deserve. Contact Mr. McGraw today in Pensacola, Florida, for consultations about his outstanding legal services.